Siding and trim are part of your building's primary defense against the weather. If properly maintained and painted, they will last indefinitely and protect the structure and interior of the building. Original siding contributes greatly to the historic character and appearance of agricultural buildings and is often a good indicator of their age. Thick, wide boards with spaces between sheathed the earliest barns, the spaces providing light and ventilation inside the barn. 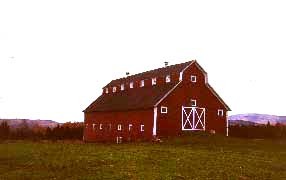 After about 1840 farmers began to sheath their barns with board-and-batten and overlapped double boards, also adding some windows. After 1870 most barns were sheathed with clapboard or wood shingle, with more windows and often a rooftop cupola for light and ventilation. Trim boards appeared on the corners of barns and cupolas and around windows and doors. In the twentieth century shiplap and "novelty" siding became a common choice for sheathing barns, and galvanized steel ventilators on rooftops helped to circulate air.